Video clip synopsis – Perhaps more than most painters, William Dobell's art relied on drawing so his sketchbooks are invaluable to our appreciation of his work. Broadband MP4 hidden14_bb.mp4 (17.4MB), suitable for iPods and computer downloads. William Dobell – Sketchbooks is an episode of the series Hidden Treasures (15 × 5 mins) produced in 2006. Students should be able to discuss art practice in relation to particular art form(s) and analyse ways in which artists develop distinctive style in their artwork. During his lifetime very little was known about William Dobell’s drawings; he considered them to be no one’s concern but his own. They were private aides-memoires to assist with his paintings and it was the paintings that were for public display. Now, his sketchbooks are an important part of the National Gallery of Australia’s collection, revealing the artistic process of one of Australia’s most renowned painters. Perhaps more than most painters, Dobell’s art relied on drawing so these sketchbooks are invaluable to our appreciation of his work. They allow us the privilege of seeing the artist’s private thoughts, as unformed ideas gradually taking shape. We can witness him develop an idea from first fleeting sketch to final painting. Dobell never painted his portraits with the model in his studio. He liked to work alone, from drawings and studies that he made earlier. In 1929, he won a scholarship that took him to London, where he stayed for ten years. By 1935, the money was nearly gone so he took a cheap basement room with a single bed, which he shared with a professional—but it seems not very successful—burglar. Dobell used the single bed at night while the burglar worked, and the burglar used the bed by day, providing Dobell with a sleeping model. 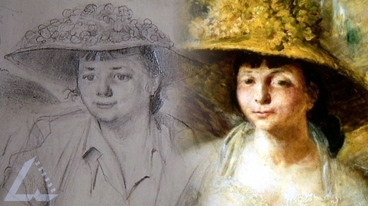 An examination of Dobell’s preliminary sketches and his finished paintings—such as The Cypriot, The Cat Lover, the iconic The Billy Boy or his Archibald Prize winning portrait of Margaret Olley—reveal a marked difference between the drawings and the final works, and tells us what Dobell wanted from his paintings. The drawing is particular; the painting is general. Dobell dramatises the image—suppressing details in favour of a theatrical pose and a riveting gaze, adding mannerist exaggerations, or turning a personal portrait into a generic type. Betty Churcher states, ‘Dobell wanted a shift to take place from his original drawings to the finished painting’. Dobell said, ‘The drawing is particular, the painting is general’. View several of William Dobell’s drawings and paintings and discuss or write about what he meant by this statement. In 1943, amid a storm of controversy, Dobell won the Archibald Prize with a portrait of fellow artist Joshua Smith. Research the issues around this event. Discuss those involved and their viewpoints. What is your opinion? Dobell investigates personality in his portraiture, both in his style and his use of aesthetics. Compare his portraits to those of another portrait artist. What are the main similarities and differences between the two? If you were going to create a self-portrait what approach would you take? What would it look like? With their permission, take digital photographs of other students. Select one photograph and place a grid over it, or draw the grid directly onto the print. On a larger piece of paper draw an elongated grid with the same amount of shapes as the original grid on the photograph. Transfer the image. This drawing could be produced in any medium of paint, pastels or pencil etc.